I did it! I just finished this piece about 15 minutes ago! I must admit, it was almost difficult to finish it. 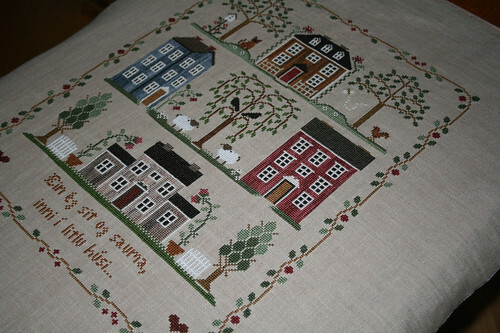 I have enjoyed stitching this piece so much that I almost did not want to finish it. But I did and here are some pictures. I had to take them with flash since it is almost midnight, but I am going to try to get better shots and some close ups tomorrow if the brightness will be enough and if it will not be raining like it has been lately. The text was changed out for a line in an Icelandic kids song. 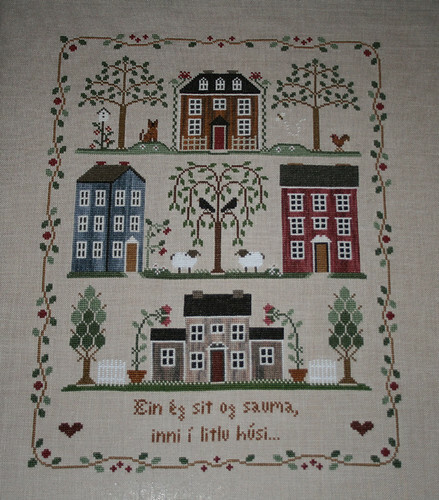 It says 'Ein ég sit og sauma, inni í litlu húsi' and that would translate to 'Alone I sit and stitch, inside a little house'. It is a song that is very dear to me and has been for as long as I can remember. I decided that I wanted to change some elements of the design and bring it a little closer to home so to speak, make it a little more Icelandic. So that is why I changed the squirrels out for a cat and a bee since we do not have squirrels here. I decided not to stitch the white star on the blue house as I thought it looked a little too American. And I decided to stitch the houses in over-dyes to get the look of painted houses, or the houses here in Iceland (especially in the city center) who have corrugated iron on them. And the final touch was the changing of the words. 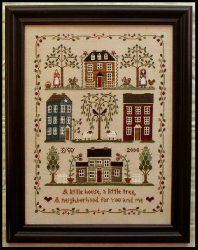 And since I decided not to stitch the women on the original design, but send them inside stitching, this lyric seemed perfect for my piece. I am so in love with it. Now to go to my framers and find the perfect frame for it! It's gorgeous! I love the changes you made. Congratulations! You are the first I know of to finish this. It looks wonderful, the colors and changes are great. I have 2 houses and a tree almost done, so it will be a while before I am done. Congratulations! Its beautiful, I love the changes you have made! Linda, this is absolutely fantastic! You are the first person I know to have finished this design! CONGRATULATIONS on such a wonderful accomplishment! Beautiful verse!! I will tell my dear friend who is from Iceland about it for sure! Congratulations Linda, it is wonderful! I LOVE the changes you have made! How gorgeous! Just beautiful! I have thought of changing the top section as well and love how you did it! What pattern did your birdfeeder come from? Christina: Who is your friend from Iceland? Just curious! Sherry: I got the pattern from the new threadpack from LHN 'Reading'. I had to change it a little though as it was too high to fit in this pattern. Your SAL has been finished for over a week and I have just got round to reading the blog. Congratulations it's beautiful and I love the changes you made. I too had second thoughts about the star on the house, but I decided that it was probably Susan's house.